Allied Group can help design, retrofit or re-engineer a Coalescing Filter for most any Compressed Air or Compressed Gas Application. We can also cross reference many other part numbers from a variety of other manufacturers. 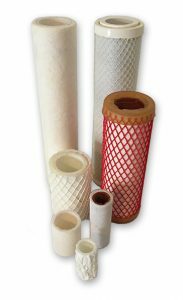 Coalescing Filters are designed to remove oil aerosol and water vapor from a compressed air or gas stream. Our filter can remove up to 99.9999% of contaminates to ensure downstream components are safe from any oil/water and particulate fouling. Our capabilities range from manufacturing filters as small as 0..18” Inside Diameter, to over 6” on the Outside Diameter. We also manufacture seamless tubes up to 96” long. Our Vacuum Forming Line of Coalescing Filters range from 0.25” ID to 10” on the OD and up to 45” long. You can create your own PN by using the chart below, or send us your drawing for us to either duplicate your current filter or have us manufacture a custom filter for your application.